Clean and remove the stems from the mushrooms. Slice them into thin slices and set aside. Chop the garlic, shallots, carrots and celery into small pieces. Clean and slice the leeks into very thin slices. Drizzle the olive oil into a large dutch oven and heat it over medium heat. Place the vegetables into the pot and saute until they are soft and the leeks are tender (about ten minutes). Salt and pepper the vegetables to taste. Add 3 tablespoons of butter to the pot and melt it into the vegetables. Add the flour and stir to combine, add the sage and cook for 5 minutes. Pour in the white wine and cook until the wine is absorbed. Add in all of the mushrooms, salt and pepper to taste, and cook for about 10 minutes or until the all of the mushrooms are soft (they will reduce in volume). Add four cups of vegetable stock and bring to a boil. Allow the soup to simmer for 10 -15 minutes. Add the half and half, the fresh parsley and the remaining tablespoon of butter and simmer a few minutes more. 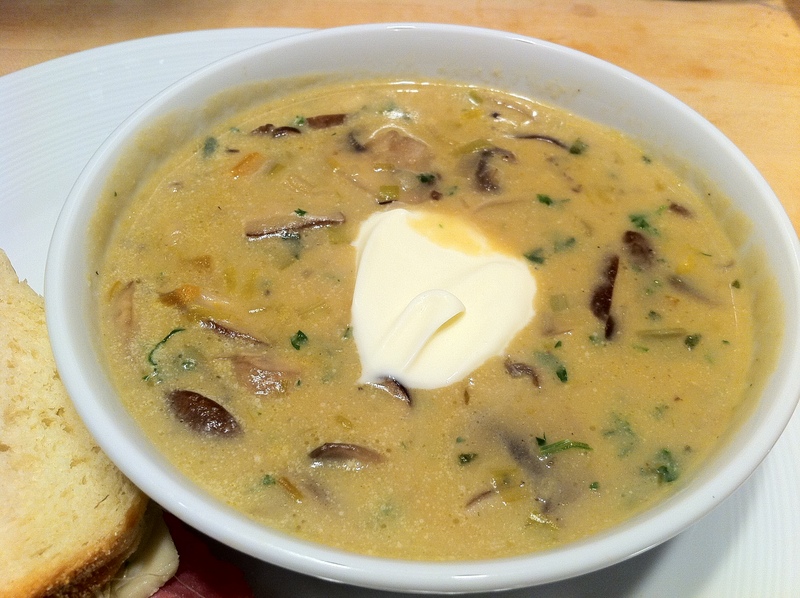 Serve the soup with a dollop of creme fraiche on top. I love mushroom soup and this sounds delicious. this sounds wonderful, especially since I’m heavily into mushrooms at the moment!